The Dance & Performing Arts Insurance Experts, supporting your industry since 1970. DanceSurance – Cover made for you! Did you know that we offer tailored insurance products for every stage of your Dance & Performing Arts career? Whether you are just starting out as a performer, doing some freelance work or running your own full-time studio we have the policy to suite your changing needs. Do you run Festival, Dance Events, Competitions and Eisteddfods? We can arrange covers for you too! Remember to enquire about our Entry Fee Protection cover too! Buying online can seem the quick and easy option but do you really know what you are buying? We pride ourselves on our personal service. Our qualified, industry experience Brokers are here to assist you with any questions you may have. 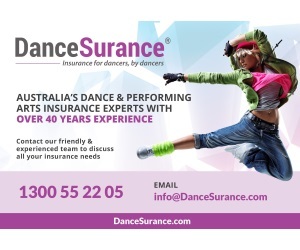 DanceSurance is a trusted provider of industry specific Dance and Performing Arts insurance products.